My frying pan gets used at least every second day, pancakes on a Sunday are a regular treat, and I like to use it to add colour (and flavour) to meat before cooking in the oven. 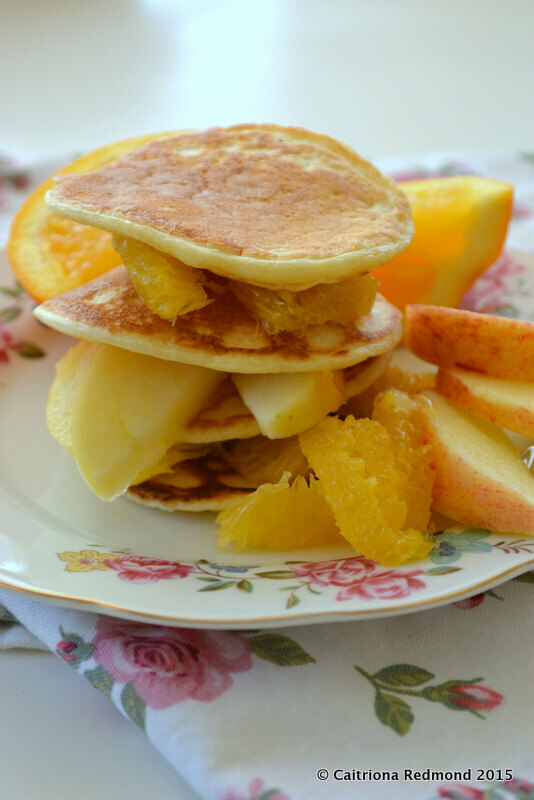 The beauty of this pancake recipe is that it doesn’t take long to put together, you don’t need to wait for the batter to get smooth, it contains very few ingredients, and it becomes a balanced meal once we have some fruit on the side. Mind you there’s nothing stopping you making this a savoury dish. I suppose we’ve become used to this as a sweet treat. The sweetness is all in the extras, not from the ingredients. I’ve been asked a few times recently for instructions on how to make pancakes – the quick and easy way. Nothing too stressful, that requires very little skill in the kitchen. 1 tablespoon sunflower oil for frying/greasing the pan. Put the flour and bread soda into a large bowl and stir so that they’re combined. Make a well in the centre and crack in the 2 eggs, pour in the buttermilk (add the vanilla extract if using). Whisk until you have a batter. Don’t worry too much if you have small lumps, as these should disappear after the next stage. Put the oil in a heavy, shallow non-stick frying pan (see notes on frying pan below). Before you put the pan on the heat, spread the oil over the surface. I like to use a little bit of kitchen paper for this. Next, put it on a medium heat and allow it to come to temperature. This takes about 5 minutes or so. Once the pan is hot, give the batter a second vigorous whisk and you should see those lumps disappear (or at worst get smaller, they’ll be gone completely in the cooking process don’t worry). Using a tablespoon as a measure, pour out 3-4 pancakes onto the surface of the frying pan. Once the bubbles begin to appear on the surface of the pancakes, and the batter has changed colour from pale to slightly darker, flip the pancakes using a non-stick spatula. Cook for a further 1-2 minutes, until the pancakes turn golden on both sides. Lift and serve. If you want to wait for all the pancakes to be cooked before serving, pop them onto a heat-proof plate and cover with a bit of baking parchment/tin foil, then a heavy tea towel to stop them from getting cold. Lift the “insulation” everytime you cook another batch to add to the pile. There are notes on how to fill the pancakes, and how to use a frying pan below the next photo. As you’ve made it this far you might like to catch up on this week’s shopping tips to save money on your grocery shopping this week? Just click here to be brought (in a new window) to my money-saving tips! Yes. Although when I was growing up we would have called them “drop scones”, they are a leavened pancake. They are also far easier to cook than the classic large thin pancakes you might be more familiar with, and you don’t have the issue with possible lumps or waiting for a batter to settle that you would have if you make crepes (thin pancakes). I’ll organise a recipe for those soon as well though – you can try both and decide yourself which you prefer to make/eat! Traditionally in my family Mam would add some raisins to the pancake mixture before cooking, then we’d eat them with a smear of butter and a little bit of jam if we were lucky. You could also add in nuts, chocolate chips, or seeds. The 3-year-old loves his with a squeeze of fresh orange juice, the 6-year-old is a big fan of honey. Choose whatever works for your family, as this recipe has no salt or sugar it’s a good base to start with. 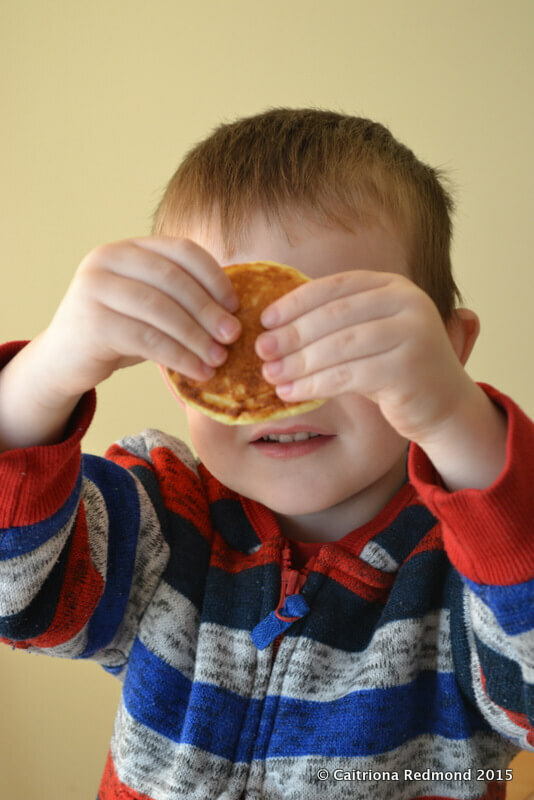 As you can see, pancakes are normally irresistible to little hands, once they are cool to the touch. He quietly came into the kitchen while I had the camera out and helped himself before I could stop him. A decent frying pan is something to be tended to; oiled, cleaned with care, and used with the appropriate utensils. You really do get what you pay for here. Last year I got a €3 frying pan which buckled as soon as I heated it, it quickly ended up in the bin. Plastic handles are great if you want to use the pan on the hob but should never be put into the oven or on top of the BBQ. Shallow frying pans are better for flipping thin items with, deep frying pans are used for large quantities, and heavy cast iron frying pans are perfect for cooking directly on the coals of a hot barbecue. “Season” your frying pan according to the manufacturers instructions and you’ll be able to clean it in hot soapy water in a matter of seconds. You’ll also be able to get great golden colour on your food as it cooks. For pancakes, I favour a shallow non-stick frying pan with a heavy base. To flip them, I use a silicone spatula. I’m not brave enough to go with an actual flip! When using a non-stick coated frying pan, never use a metal or wooden implement as you could scratch the coating. Don’t store or stack anything inside of your frying pan to prevent scratches or damage. Instead store the frying pan either from a hook, or resting sideways in a press. It first happened when the boys were still a twinkle in my eye, we were out shopping in discount supermarket. I was rummaging in a basket for something I wanted, when I heard a call of “C’mere ’til ya feel the weight ‘a that!”. I looked around to see my (now) husband standing over me with a giant frying pan held above his shoulder, perfect height to clatter me over the head with. There was a still quiet pause (when all the other shoppers had a good gawk at the scene), then I cracked up laughing. He doesn’t know his own strength, that much hasn’t changed. Although he doesn’t lift the frying pan so high in the air anymore, he still hefts one in his hand as he passes a rack of pans on sale, with a glint in his eye he’s guaranteed to make me chuckle every time. The boys look mystified when he does it. He bought me a new frying pan yesterday as we now have an induction hob all my old pans don’t work! I smiled. *Prices correct as as of Tesco February 2015. I used own brand plain flour, buttermilk, and bread soda but I did use free range eggs. Savings could be made if you didn’t use higher welfare products. Yep I think it’s such a great versatile recipe. No need to stress over pancakes. Yum. Also major tea-approval! Your blogs are entertaining and the food easy and delicious. Laughing at your frying pan story, well wear to you new one!! These look yum but we are totally sold on the banana ones in your book, they are a firm favourite here. Oh I love those banana pancakes. Mmmmm Thanks J! 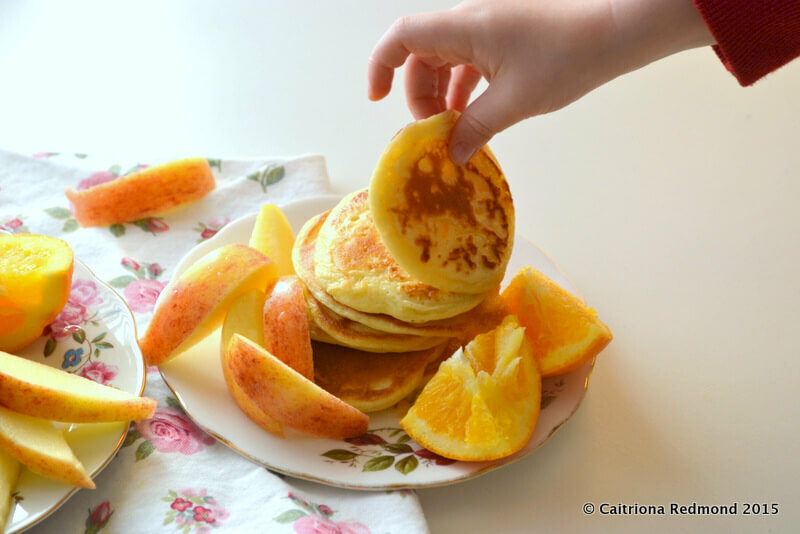 Hi Caitriona – thought you might like this idea for pancake faces and designs too- Going to try it later. Brilliant. Now to find if I’ve a squeezy bottle!